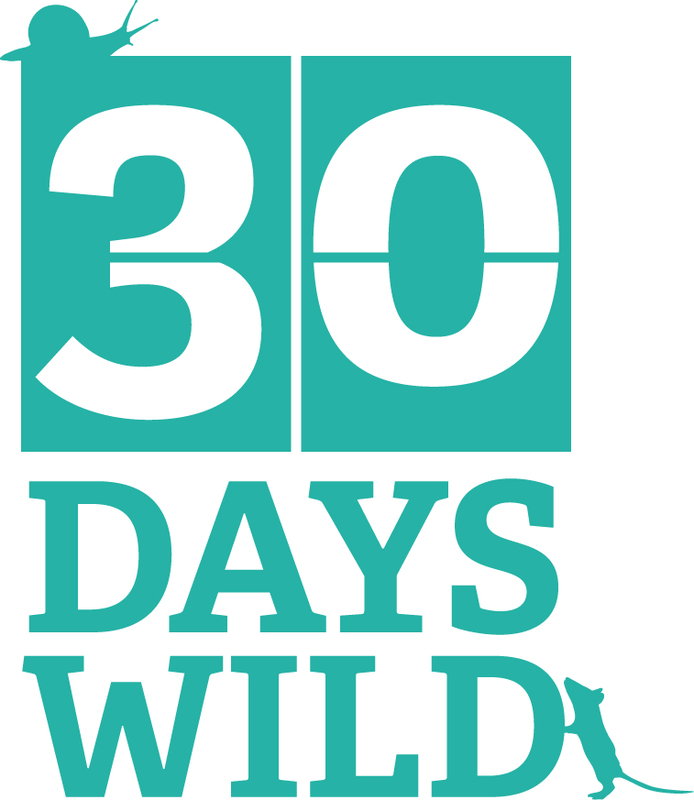 It’s Day 12 of 30 Days Wild and I headed to Worcestershire Wildlife Trust’s headquarters – Lower Smite Farm. It is, as its name suggests, a working farm – but one that is managed with the wildlife in mind in everything that’s done. The Trust have created a nature trail that encompasses a range of habitats and that’s what I followed today. The trail started in the wildlife garden, which was an absolute delight. 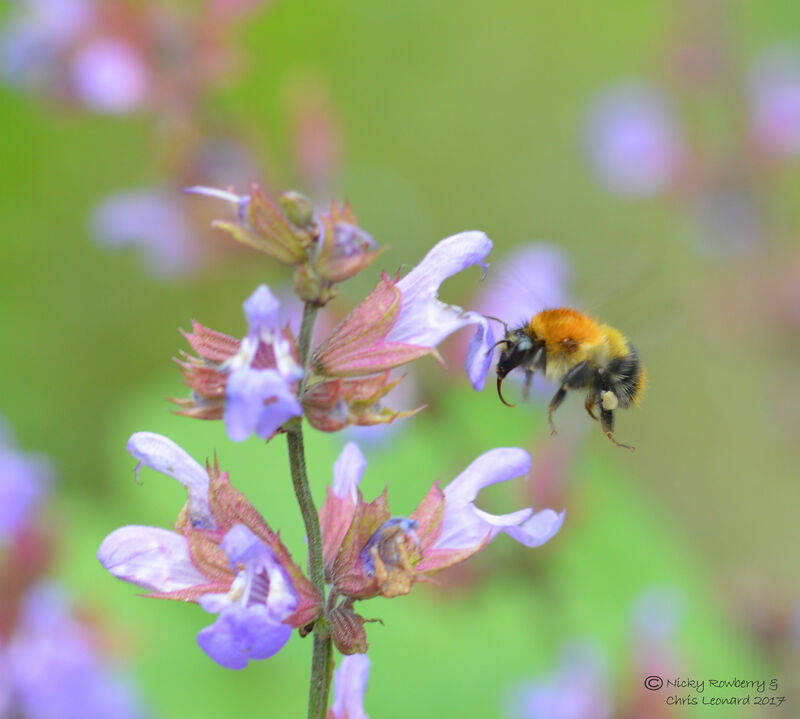 There were lots of ideas for wildlife gardening and plenty of information. 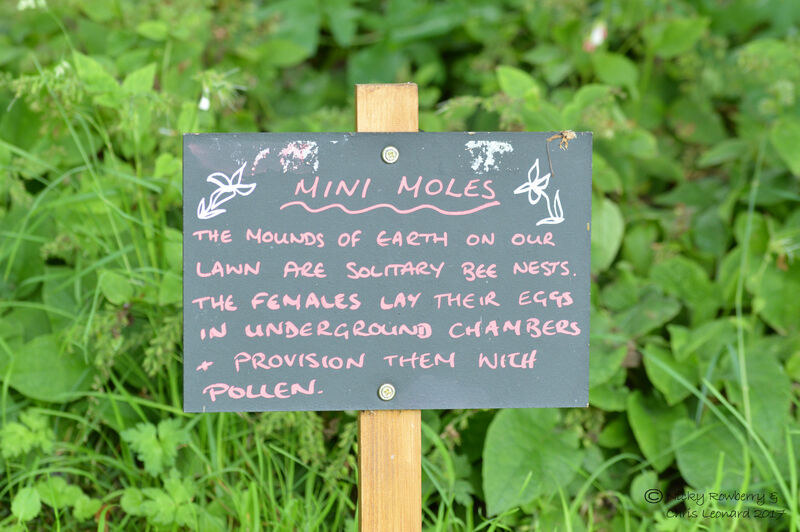 I loved the little blackboards that were dotted around explaining things, like this one about solitary bee nests. 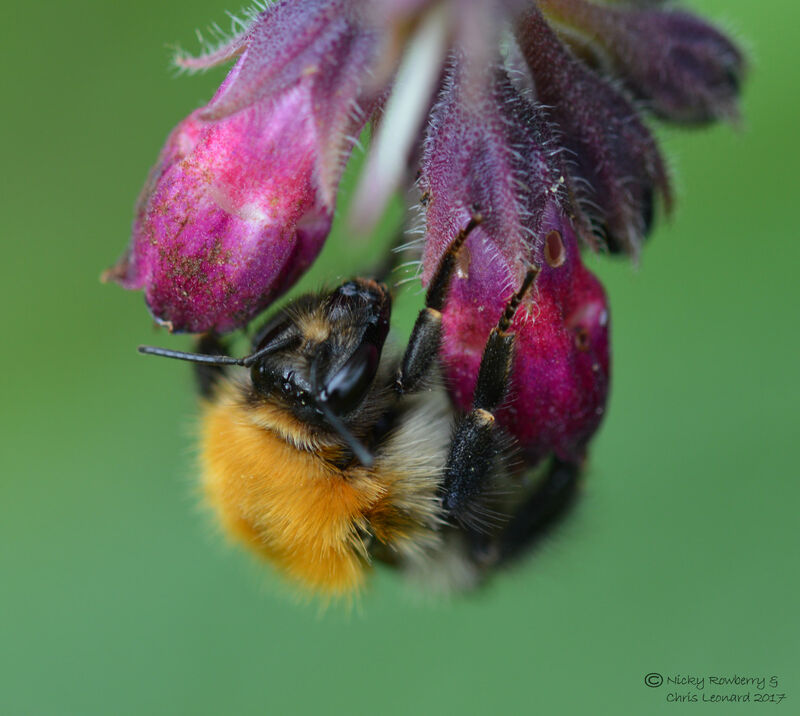 Not too surprisingly the whole site was a-buzz with bees, both in the garden and in the fields beyond. 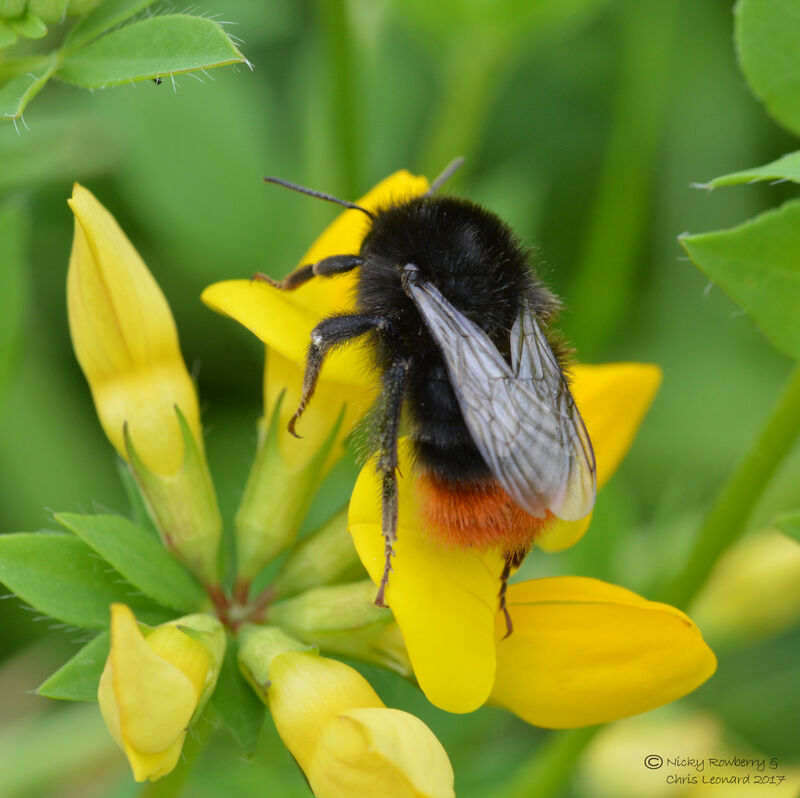 Every time I see a bee or a butterfly on the bird’s foot trefoil, it makes me think – we really must plant some of that in our own garden! 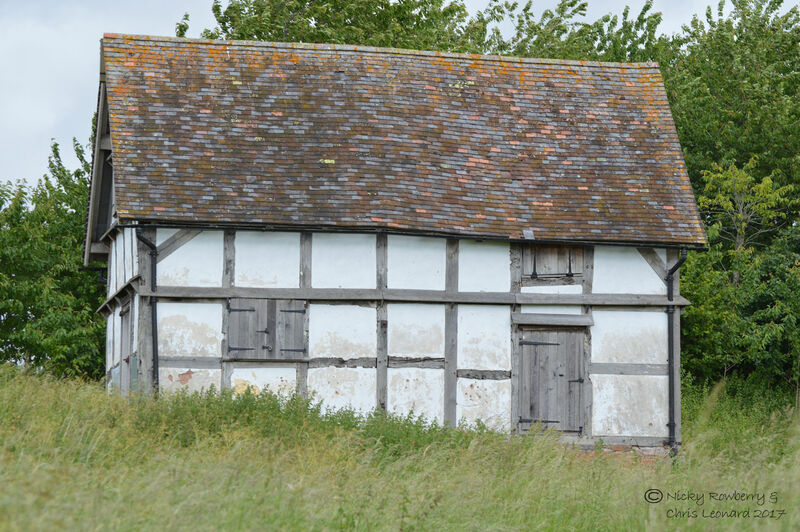 From the wildlife garden, the trail took me to the Granary; a 300 year old barn that is apparently full of bats. 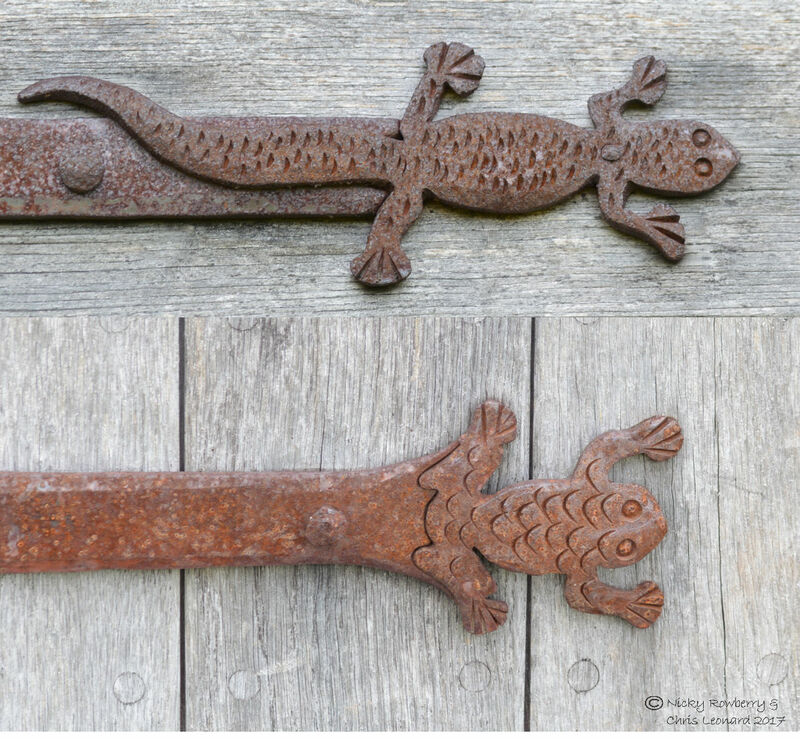 The building had these wonderful ironmongery lizard and frog on the doors – don’t know if they are original features or later additions, but if I’m ever lucky enough to own an old house, I want a pair of these! The trail led from the Granary past a pond and wetland area. I thought I got a glimpse of a reed bunting, but it was too fleeting to get a photo. After the pond the path turned into a field and followed the hedgerow. 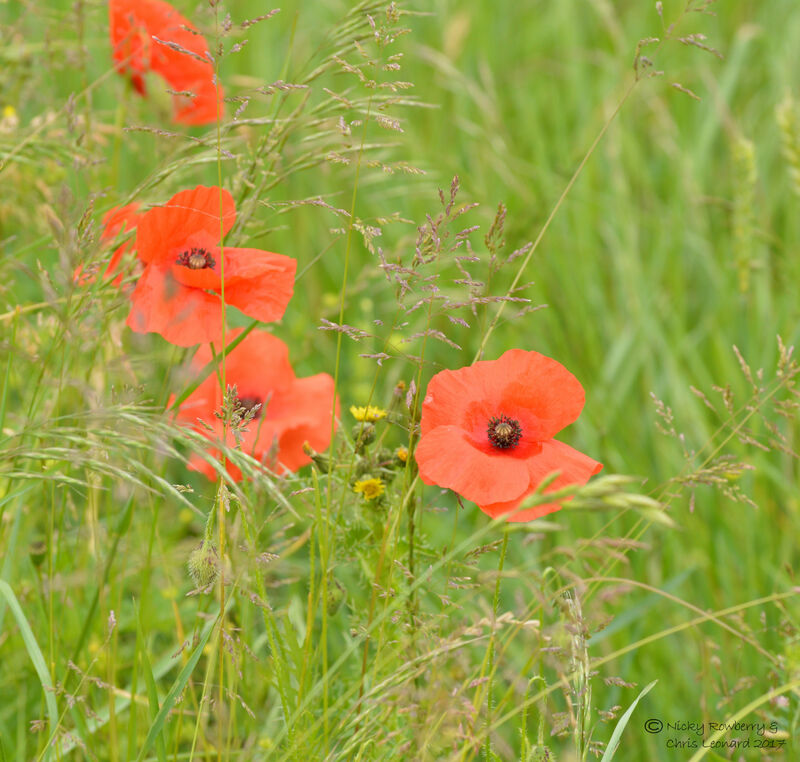 The margins of the field were full of wildflowers, such as these stunning poppies. All morning I could hear lots of birds, but most of the time they remained hidden. 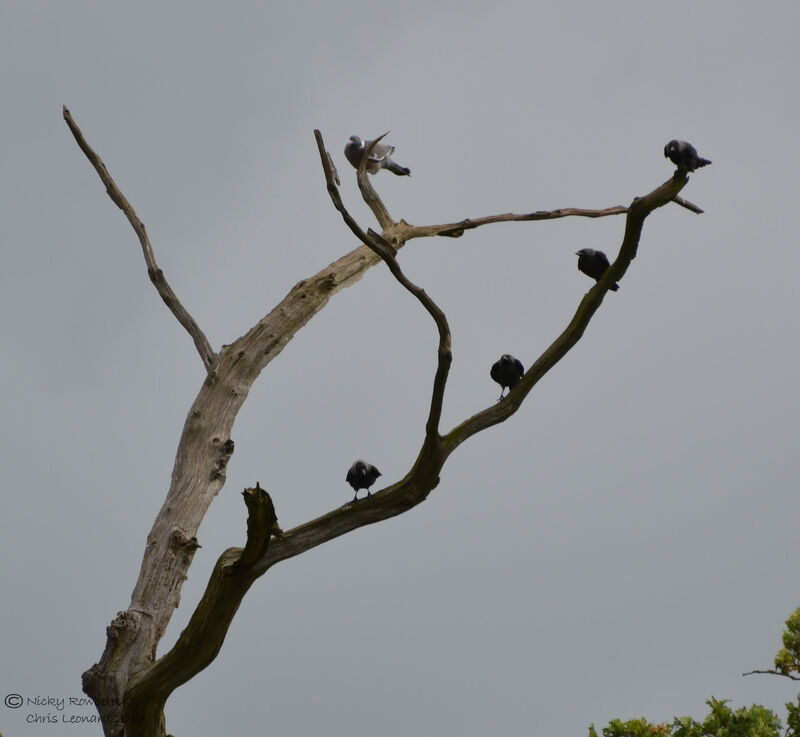 So I loved finding this tree with a bunch of jackdaws, spaced out perfectly along the branch with a single pigeon lording it above them! The next pond area had lots of rustling noises coming from the reeds, but presumably I had made too much noise approaching and nothing would show its face. 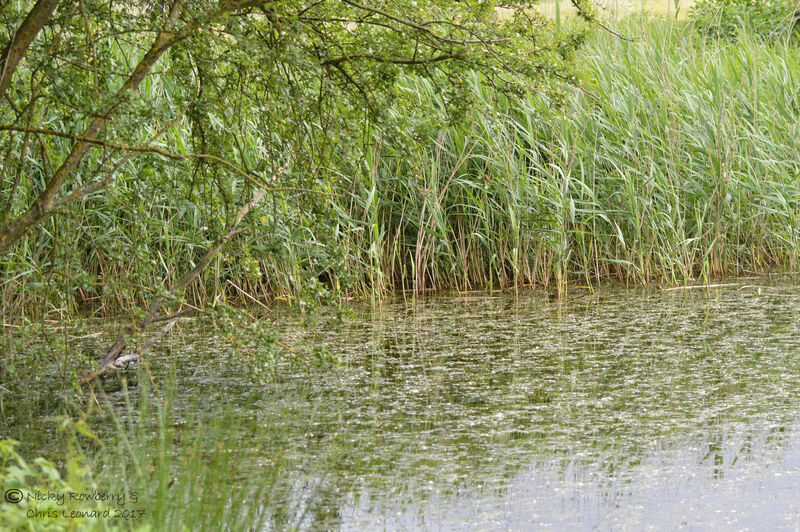 But as I started to leave the pond, I could hear a strange bird call – almost like a squeaking cough! This little bird turned out to be the source of the strange noise. 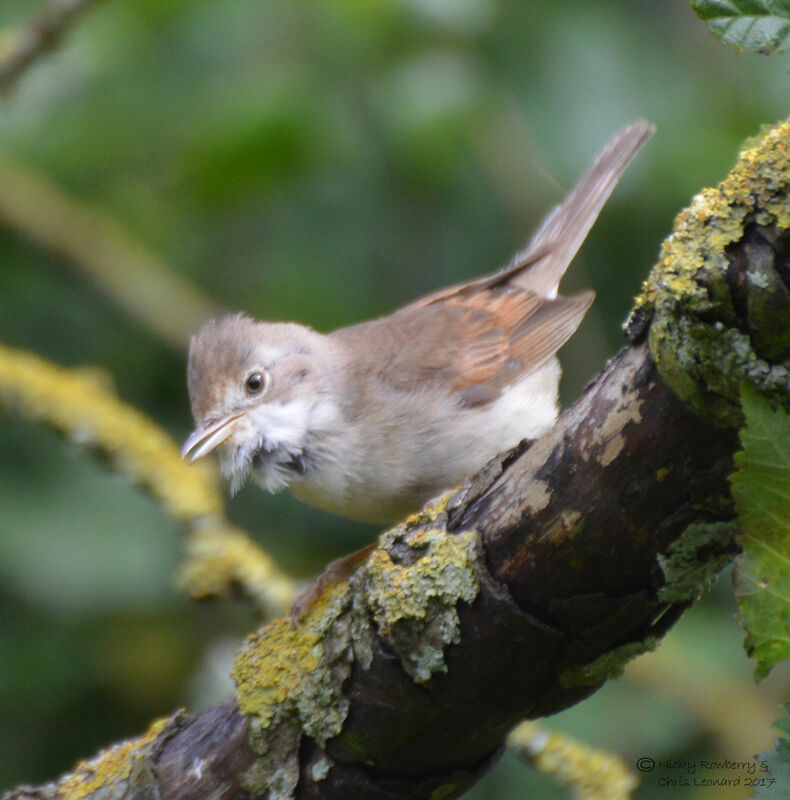 A bit of googling back home and I think it was a Whitethroat. Apparently they make this call when they have young – if it was trying to warn me off though, it had the opposite effect as I stopped to find out what it was! As it called it puffed up the white feathers on its throat – maybe also intended to scare me off? I tried videoing it to record the call, in case I couldn’t identify it when I got back home. 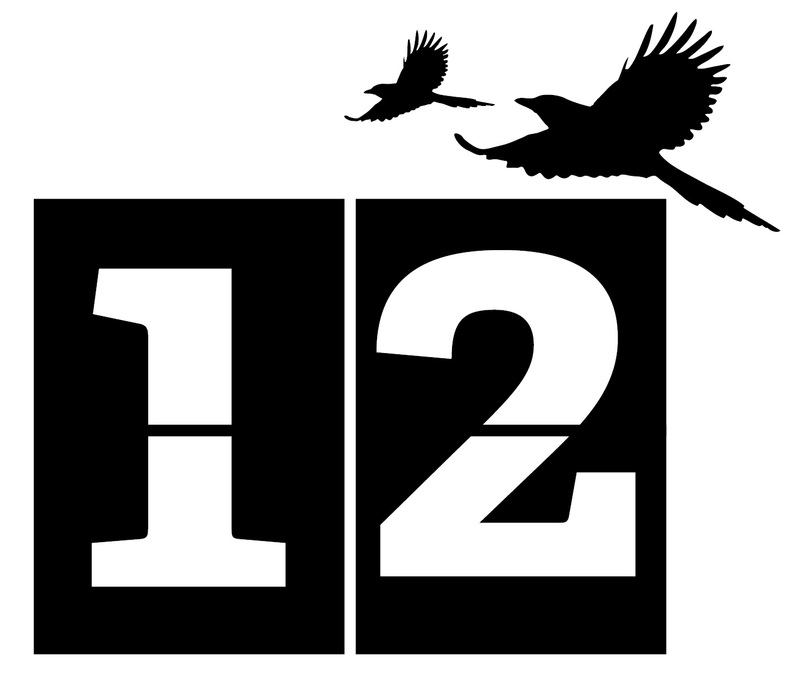 The video is not a great success as mainly what you can hear is the wind (will it ever stop blowing this June? 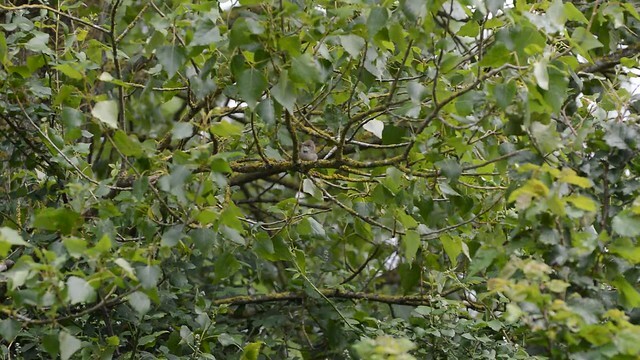 ), but you can just about see the bird and make out its short staccato call. 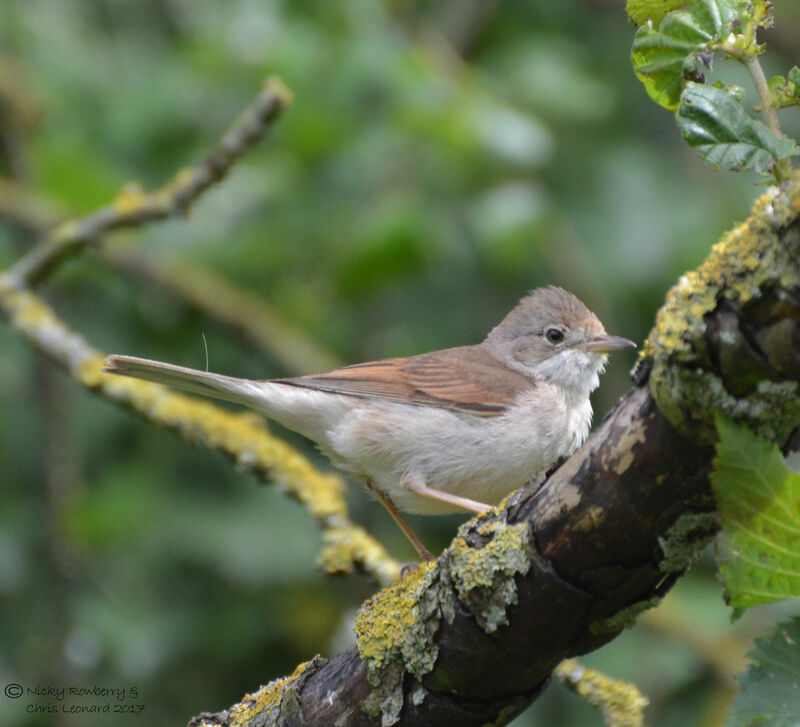 Leaving the irate Whitethroat behind, I followed the path into some fields. It was lovely to see lots of Meadow Brown butterflies. As I walked I kept flushing them up from the path, but I never seemed to be able to spot them before they took off and were gone. 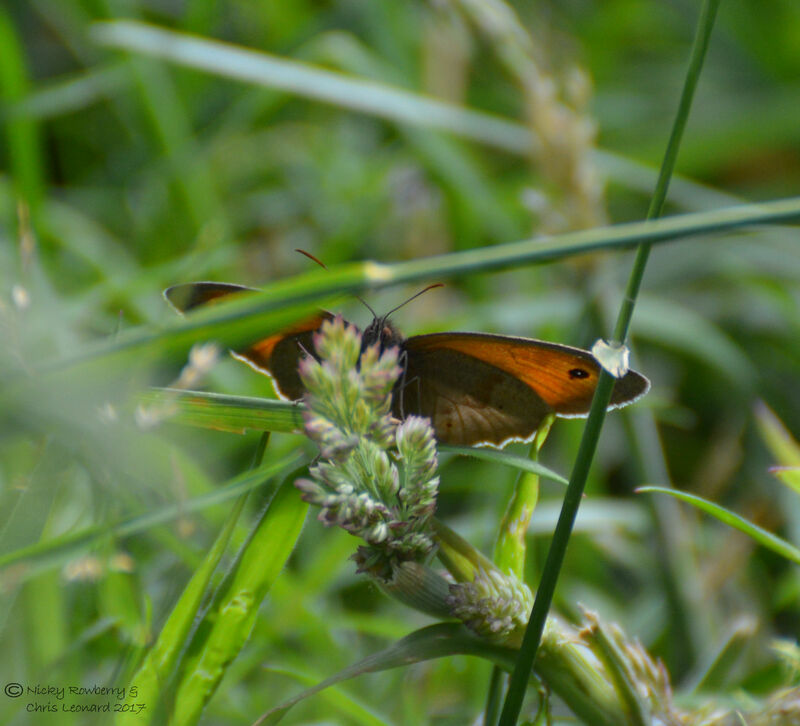 So the best Meadow Brown photo I managed all day was this poor one taken from an odd angle! 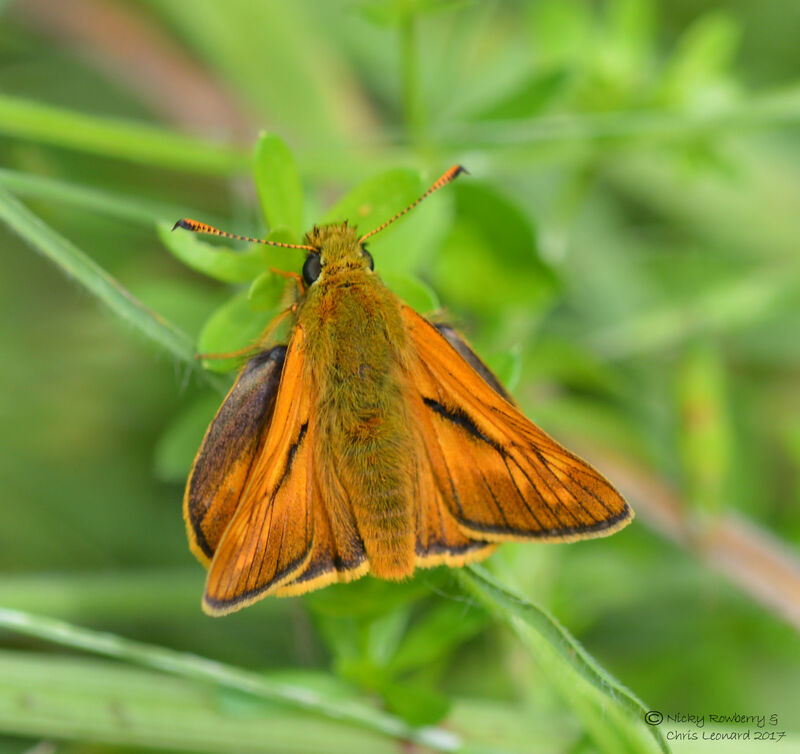 I had more luck with the Large Skippers which were also fairly common today. They looked lovely fresh specimens and were bright orange, with their distinctive hook tipped antennae. 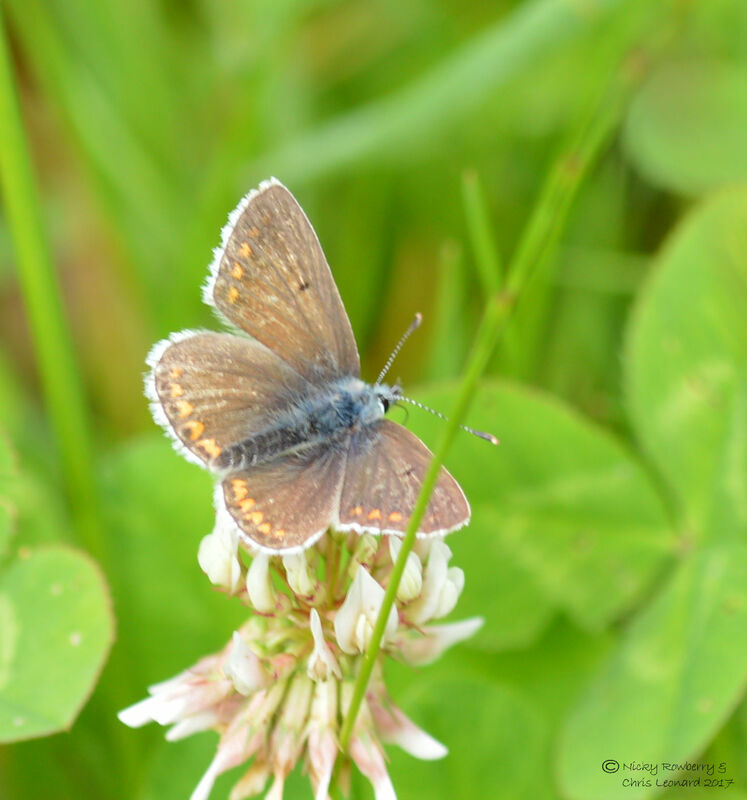 I was also really pleased to see my first Common Blue butterflies of the year, feeding on clover. One insect which I kept spotting and which I would have loved to get a decent photo of was a Scorpion fly. 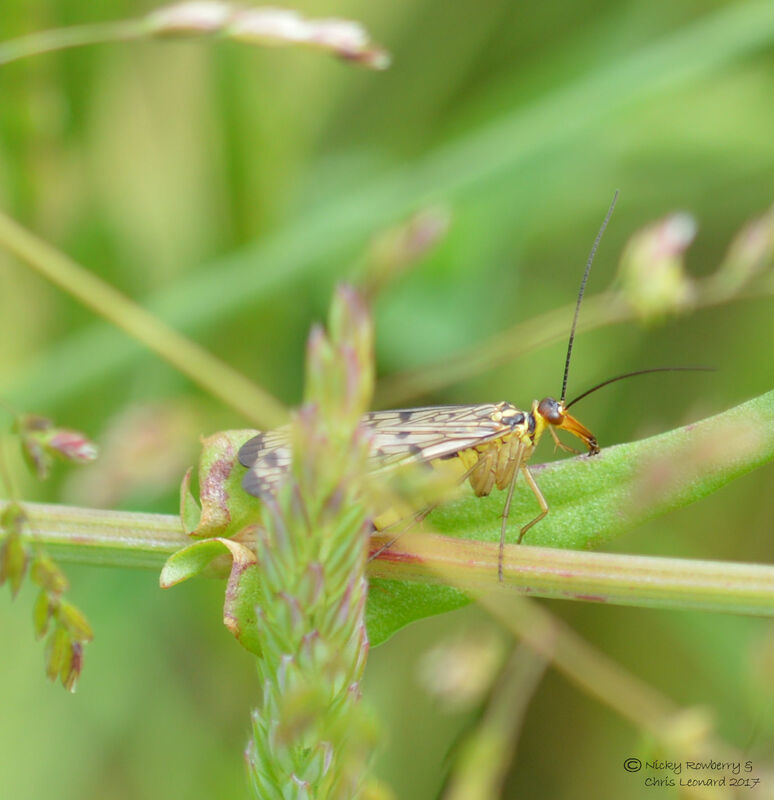 The key thing about a Scorpion fly is that it has a tail like a scorpion – so guess which bit was hidden by bits of grass in all my photos? 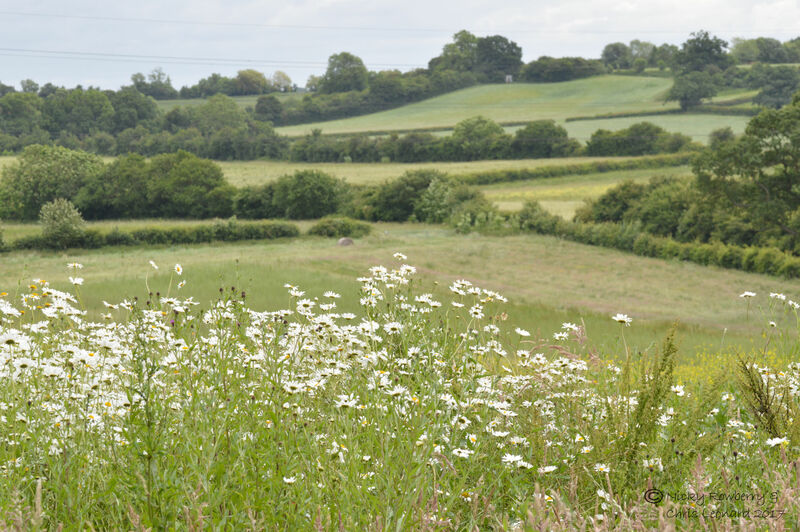 There is a convenient bench at the top of one of the fields where you can sit and look out over the farm across Worcestershire. This photo reminded me of one of my Mum’s paintings – she often used to paint views with flowers in the foreground like this. Heading down hill back towards the farm, the trail leaflet mentioned that you could see ridge and furrow marks in the field. 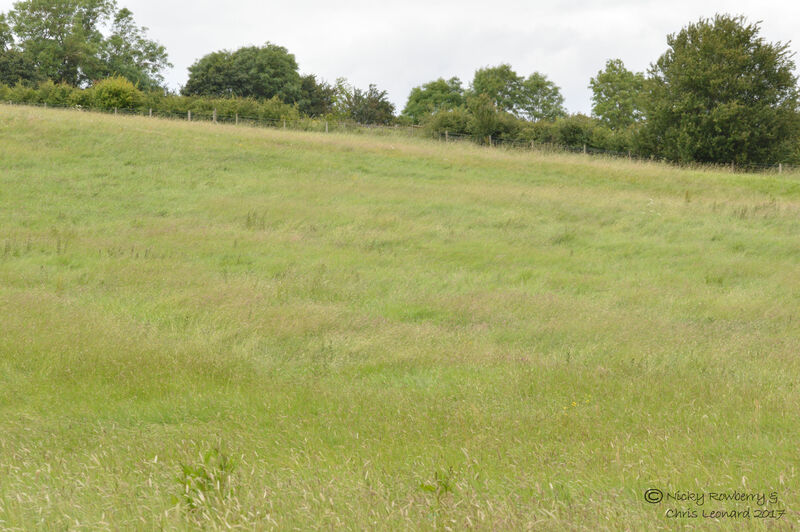 This indicates that this field was farmed as far back as the middle ages, when ploughing techniques meant the soil built up into these ridges. You can just about make it out in this photo – wonderful to see a part of living history like this. So that was my morning spent meandering around Lower Smite Farm. It’s another place that is definitely going on my return visit list – preferably on a sunnier day with no wind though (should we ever get such a day again!) I loved the mix of natural history and cultural history that this place has, with its remnants of old farm buildings and fields. Perfect place for the trust’s HQ!